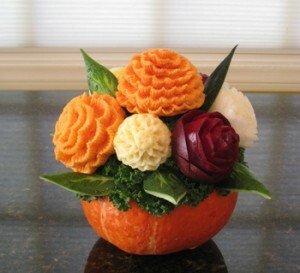 The first time that I carved flowers from vegetables was just before Thanksgiving. I assembled this bouquet and brought it to my mother-in-law’s home where about 25 of us were gathering for Thanksgiving dinner. 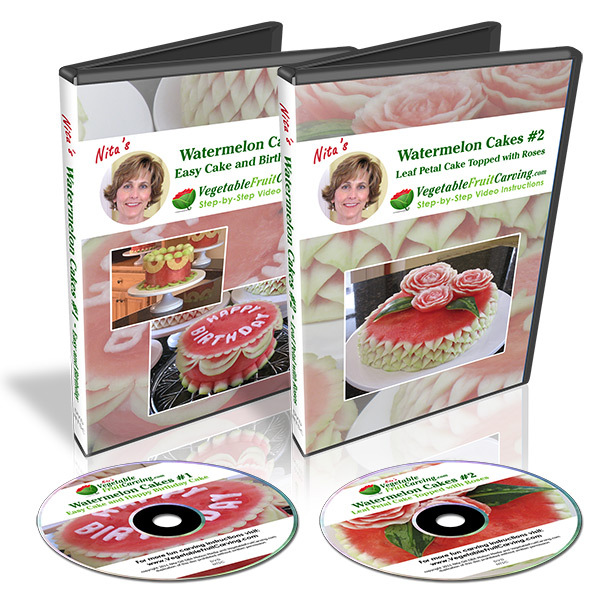 I was excited to bring them to use as a centerpiece but Wow, I never expected such an enthusiastic response. I got so many compliments even from the men who usually don’t care about this sort of thing. The children were enchanted, too. One Uncle kept insisting that I should be on the Rachael Ray show. If you look close, you can see that these are not the most perfect flowers ever carved. After all, it was my first time carving. But if I can do it and get all those ooohs and aahhhhs, so can you. 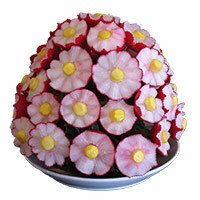 I carved roses from beets and I made flowers from yams and sweet potatoes using corrugated U-Cutters. The leaves, I carved from cucumbers. Then I assembled the bouquet using a squash for a base and used some lettuce or mustard greens (I forget which) for filler. You might want to try it for yourself. 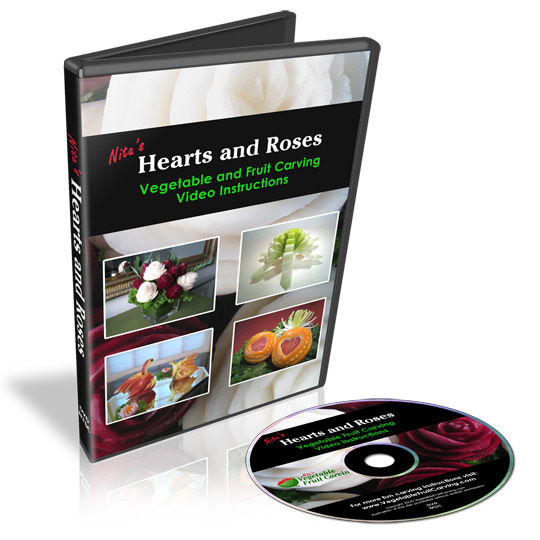 You can find video lessons on how to make these root vegetable flowers and the tools required in my online shop. Very cool! I was wanting to try my hand at some carving and this looks doable and very beautiful. If you can do it, so can I (hopefully). Thanks.